The original Backpack Double Sling. 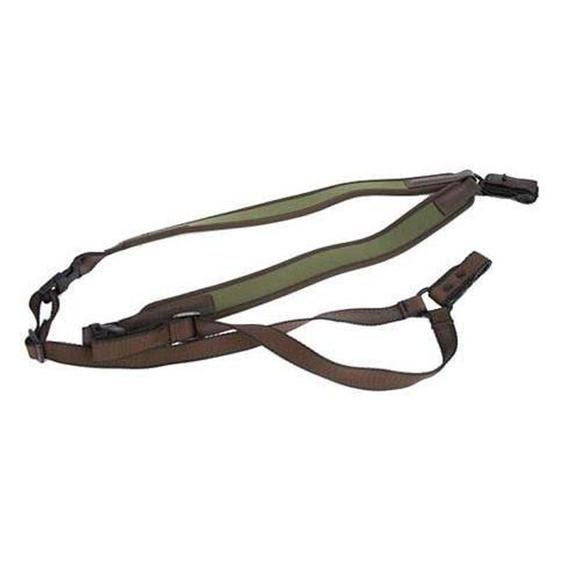 When you're hunting, and want both hands free for climbing trees, hills, mountains or carrying your gear, you need a rifle sling carry system that's comfortable and safe. The "Backpack Double Sling" will let you move with ease and confidence. The original Backpack Double Sling. When you&apos;re hunting, and want both hands free for climbing trees, hills, mountains or carrying your gear, you need a rifle sling carry system that&apos;s comfortable and safe. The "Backpack Double Sling" will let you move with ease and confidence. You&apos;ve seen slings similar to this in the Winter Olympics in the Biathlon competition; could you imagine trying to get from target to target quickly on Nordic skis using a single traditional one shoulder sling? The Vero Vellini Double Sling is made from the highest quality materials and workmanship in Germany. It fits snug to your back like a backpack and comes off quickly for a shot at moment&apos;s notice. Each side of the Backpack Double Sling is adjustable and can easily fit over heavy winter clothing as well as offering quick releases on both sides to aid in getting into a shooting position quickly. The "Backpack Double Sling" is made with our Air Cushion® high density layered neoprene in Forest Green with Dark Brown piping and durable naturally tanned brown leather end panels that will accent your firearm handsomely. Measurements Fits firearms with swivels; 20mm (3/4”) European, one inch, to wider swivel styles.